Several years, game editions and versions in the making, Codex: Orks Rewrite reimagines and expands upon current and previous official Codexes. In its pages, you'll find revised rules, units old and new, and plenty of brand new content. 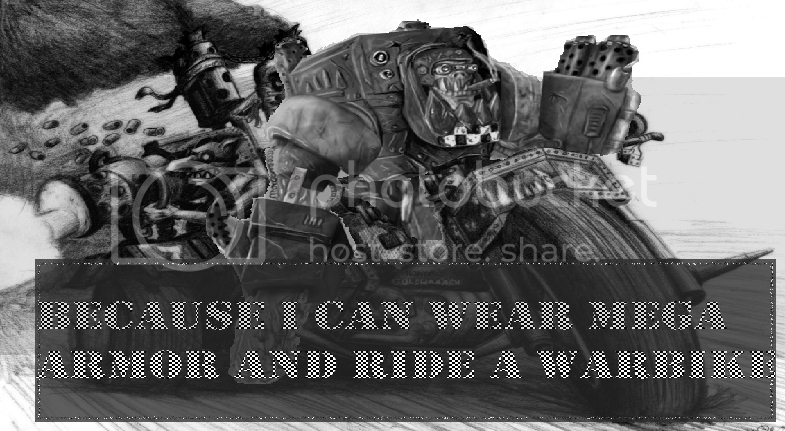 - Armywide special rules that give the feeling of a proppa Waaagh! Have a flick through, see what you think, leave a response - I'm always looking for discussion and feedback (preferably constructive, but b***h if you need to! ). Edit: The link has been removed by one of the mods, for reasons which are totally justified and understood. Right now the only way to access COR without emailing me and asking for it is to type 'Codex: Orks Rewrite' (without apostraphes) into your favourite search engine - hopefully the first topic that comes up will be 'Codex: Orks Rewrite Ver. 3 - DA GOFF FORTRESS - Da WAAAGH'. Convoluted, I know, but them's the breaks. I've decided to spend a few posts explaining some of the changes in COR. These will be posted whenever I feel like it. Since COR was written while we still had the 4th Ed codex, the Waaagh! is based on that. We all know about Fleet, and the wound on any roll of 1. But COR beefs the Waaagh! up significantly, also granting Adamantium Will, Feel No Pain (varied strength), and replace S&P with Relentless. It also buggers up Psychic Hoods (for ALL players!). Mob Rule similarly operates like 4th Ed, except its now based of the number of Wounds in the unit rather than the number of models - this helps smaller units like Nobz and Kopta Boyz stick around with the big mobs of Boyz. Also, if your unit outnumbers the enemy unit 3-to-1, you gain Fear! Ramshackle is back to it's glory days, and lots more vehicles have access to it now. I'm Da Big Boss is found on a few of the special characters and the Warlord. It simply ensures that such models become the army's Warlord. Grots and Snotling 'Ordz are Sneeky Gitz, able to traverse obstacles and Move Through Cover. Weedy allows you to cram more Gretchin and Squigs into your transports, counting them as half a model for the purpose of transport capacity. Finally is Monstrous Transport (yep, you can tell where this is going! ), allowing the model to act as a transport vehicle for allowing models to embark or disembark, or shoot from it. Taster #1 concludes! We'll dive into the H.Q section next time. 'Ere we go again, with Part 1 of Generic H.Q.s. This Ork is the biggest and the strongest, so that means he's Da Big Boss. No-one else tells him what to do unless they're at least as big as he is. The basic Big Boss has the ever-reliable Warboss profile, with the addition of Eavy Armour. He'll work just as well as he always has if you stick to the upgrades you know will work, but since the Boss gets access to all the shiniest toys, you may want to consider all the available options. If that Choppa isn't killy enough, give him something else! The classic Power Klaw may seem the obvious choice, but with the revised Big Choppa being genuinely useful, the Big 'Amma giving Concussive attacks, the Tankhamma allowing high Strength attacks at Initiative, and the suspiciously Chainfist-like Buzzsaw making box-breaking even easier, the choice is no longer clear-cut. Similarly, that Slugga might be a bit too weedy, so give him a good Shoota or a Kustom Mega-gun! Even more firepower becomes available when you treat him to Mega Armour, a Warbike or a Deffkopta, allowing powerful mounted weapons. Perhaps your dream Boss has ties to a Klan, or takes to a particular aspect of Ork Warfare? Enter the Boss Types and Klan Affiliations. Selecting a Boss Type grants access to specific wargear and special rules that allow your Boss to support corresponding units. Like your Tankbustas? Make your Boss a Busta Boss and get a Rokkit Launcha and Glory Hogz! More a fan of Flash Gitz? Make him a Snazz Boss for that Snazzgun/Gitfinda kombo! Selecting a Klan Affiliation affects all units in the Boss's Detatchment, giving them access to unique wargear depending on their Unit Type. The Boss also gains a personal benefit, and another benefit which affects his unit. A Blood Axes Boss, for instance, gets Hit & Run and Night Vision, and units in his Detachment can buy Hit & Run and Scout. Any other options? Loadz! Aside from access to relics from Da Loota'z Stokkpile, the Big Boss can get better armour (Snazzy Armour for 3+, Mega Armour for you-know-what-this-is, Cybork Body for 5++, Supa Cybork for 4++), pimped-out rides (Warbike, Deffkopta, Rokkit Pakk or even a Boarsquig! ), welcome stat-boosts (like the good old Attakk Squig) and other useful gubbinz. And if all that is somehow still not enough for you, you can invest a little more and turn your Warboss into a full-blown Ork Warlord, giving him a statline that wouldn't look out of place on a Monstrous Creature! The Big Mek is easily the most versatile of all the H.Q.s, able to respectably fulfil almost any battlefield role. Whether you need dakka, choppy, support or technical know-wotz, the Big Mek can do the job. The Big Mek has access to a HUGE list of gunz, allowing you to tailor him to whatever ranged role you need. If even more punch is required, apply some Kustom Jobz. He also has access to an excellent assortment of Melee weapons, and his Nob-level statline ensures he can hold his own in combat, should he ever get stuck there. You're probably best off keeping him out of combat, however - not because he's bad at combat, but because he's better at range. Like the previous Bosses, you can buy the Big Mek better armour (Mega Armour especially helps with some of the heavier range weapons), a mount (either a Warbike or a Deffkopta) and plenty of other utilities. Probably the most attractive option, however, is the infamous Kustom Force Field - giving nearby models an Invulnerable against shooting, especially in an armourless horde, is invaluable, and he can even tinker with it to extend its range! Sitting outside the FOC are the Oddboys. These individuals provide support to the green horde. Each Oddboy is one of six different types. Most familiar is the Mekboy, moved from unit upgrade to separate purchase. If you need more Mek'z Toolz and KFFs, you know where to go. Painboys spread Feel No Pain around. Mad Doks allow models to restore lost wounds. Banna Boys allow cheap Waaagh! Bannas in your units. Brewa Boys provide a risky boost to the stats of a friendly model in his unit. AND THEN THERE'S YELLA BOYS, WHO CAN SHOUT REALLY LOUD! Regardless of which one you go for, Oddboys have access to a fair amount of wargear, including relics if you're so inclined. A first for the Orks is a Grot H.Q.! The Head Honcho serves as the actual army Warlord, while his group of Revolushunarees acts as a bodyguard. As you might expect, the Kommittee is not the same kind of powerhouse as an Ork character. It instead exists to enhance Grot-based units, even the mechanical ones! That said, you can make the unit hit a little harder simply by adding more models, or upgrading some of them with better weapons and armour. The Runtbot is worth mentioning here, doing the job of the KFF for a single unit! Next time we'll take a look at the Weirdboy and the Orks' unique Psychic Phase. Hey guys, apologies for not posting recently, but COR's been undergoing some expurt skrutinee from the boyz over at Da Waaagh!, and has updated since my last post here. I've made some amendments to previous posts to better reflect COR's current state. So, after our long absence, we're back with the Weirdboy and the Orks' Psychic Phase! The big Ork Psyker has the same Nob-level statline as always, except for LD8. He's Mastery Level 2 (and the option of upping to ML3), and the Waaagh! Konduit rule gives him an Invul. The Weirdboy carries a Slugga, a Koppa Staff (a better Weirdboy Staff) and Eavy Armour, and can replace his Slugga for one of several weapons. Other bitz are available as well, such as relics, Snazzy Armour, Bosspole, and Attakk Squig. The Weirdboy only has access to 2 psychic disciplines, both unique to COR. The Powers of Gork are offense-oriented powers, a mix of Witchfires, Beams and Blessings. The Powers of Mork are more sneaky, providing Blessings, Maledictions and a Nova. Now we'll look at the Orks' benefits during the Psychic Phase. During the Psychic Phase, Orks may gain more Warp Charge than other armies depending on model concentration. Units within 12" of an Ork Psyker have a small chance to generate an addtional Warp Charge, with the chance increasing with certain factors and decreasing with others. This bonus comes at a price, though. If you still have unspent Warp Charge at the end of the Psychic Phase, ALL Ork Psykers take a hit! To finish up this post, we'll have a brief look at the Warlord Traits. I say brief because there are so many! The Waaagh! Traitz are available to any army Warlord (except the Head Honcho), and largely focus on buffing nearby units further during the Waaagh!. The Boss Traitz are available to the Warboss and Ork Warlord, usually granting close combat-based bonuses. The Weird Traitz are available to the Weirdboy, boosting his Psychic ability or survivability. The Mek Traitz are available to the Big Mek, giving benefits either to his shooting or to his vehicles. The Dread Traitz are available to the Orkanaut, making the Walker more killy or more durable. The Grot Traitz are available to the Head Honcho, buffing his Kommittee or Grot-based units in the army. So we're looking at a total of 36 Warlord Traits! And that's before you take the BRB traits into account! With the Death From The Skies supplement introducing Flyer Wing Leader Traitz, COR also has its own table for the Ork Flya (we'll talk about that later). That'll do for tonight. Next time (whenever that is), we'll have a look at the Troops. Ok, so next time turned out to be six months later. We're still alive, people! COR recently updated to Version 3.0.4 - check it out! In this post we'll take a brief look at the Troop choices available in COR. Ah yes, the humble Boy. You know them, you love them, they're the workhorse of the Ork army. Boyz perform as well as ever, and now only set you back 5 of your shiniest teef each! Heads-up: The layout of this unit sets trends for Boy-level units. Starting out with Slugga/CCW and Stikkbombz, Boyz can buy Shootas, Choppas, special weapons and better armour. They also get access to three (!) different dedicated transports. The Nob benefits from additional weapon options, as well as defensive options such as Snazzy Armour and Cybork Body, mitigating their perceived weakness to challenges. But we're not done yet! The unit has the option to upgrade to two new types: Skarboyz and Stikkbommaz! Skarboyz lose Furious Charge but up their base Strength to 4 (5 for the Nob), increasing their offense in prolonged combat. Stikkbommaz gain two additional grenade types, and a special rule that allows more than one member to throw them at a time, and at greater range. Who needs a Formation to Green Tide? You can do it with just one unit! A Proppa Mob is for those who think 30 Boyz is too few. With a starting squad size of 50, you can just keep adding more and more Boyz - there is no upper limit! This unit gets a few more special rules to emphasise their hard-and-fast approach, allowing them to move through terrain better and costing them the ability to claim and contest objectives. Additionally, they allow nearby retreating units to merge with them! The Orks in this unit get largely the same options as the Ork Boyz unit, with the exception of no range weapons. A Nob is also available, again with the same options as the Boyz (minus range weapon upgrades). Long story short, they act as a sledgehammer compared to the Ork Boyz' suspiciously hammer-like scalpel. The Dread Mob is alive! Deff Dreads can be fielded in squads of 1-5 as Troops. Walkers historically aren't the most competitive choice, but hopefully some cheap squads of them will do the trick! Heads-up: Like the Boyz, the Deff Dread Mob sets trends for subsequent Ork Walkers. Each Deff Dread starts out really cheap, but with a total of zero weapons - you have to buy two from the list to make them legal, and have the option of taking two more. Klaw Dreads? Of course. Dakka or Skorcha Dreads? Go for it. Mixed combat? Sure. What could make this unit better? How about a Dread Nob, with better stats and options for more powerful CCWs? What could make it even better? How about a wealth of vehicle upgrades, like Extra Skrap for +1 Front Armour, or a RED PAINT JOB for Go-Fasta Dreads?! A Grot by any other name... Not just Gretchin though - Squigs, Snotlings and Yoofs get in on the action too! Classically used for objective claiming, tarpitting or just a simple meatshield, but the different Runt types allow the unit to 'excel' at various roles. They may be low quality, but they're damn cheap! Zodgrod (covered later) can join any Runtz unit. 10-50 models in a unit of Runtz, all of the same type, accompanied by a Runtherd for every 10. Gretchin of course provide weak but accurate firepower, while Squigs give a better close combat punch, Snotling 'Ords drown the enemy in bodies, and Yoofs are essentially Ork Conscripts. A few wargear options exist for the Gretchin and Yoofs, and the Gretchin and Squigs gain a special rule to clog up enemy big guns. That's the Troops out the way. Next time we'll start looking at the Elites (and hopefully not be another six months away). Now we've got the core force out the way, let's move on to the options in Part 1 of Elites. Many of the Ork Elite choices are compiled into this single entry since their composition is so similar, so first we'll cover the shared options. A unit of Speshul Boyz numbers 5-20. They've got the usual Ork special rules, the usual Boy wargear (except heavy weapons), the usual Nob upgrade and the usual dedicated transports. Each type of Speshul Boy adds and/or replaces wargear or special rules. A brand-spanking new unit of Boyz that throw out their Sluggas for Dakkaguns. A few of them can swap again for Eavy Shootas or Dakkakannons, and the unit can take a chance on the Needz Moar Dakka! rule (it'z still not enuff...). Our first veteran unit hasn't changed much. The Big Shoota option is replaced with the Speshul Shoota, and the unit can get Kamo Bitz for better cover. One of two units that Snikrot (covered waaaaay later) can join. These new boyz throw out their CCWs for Big 'Ammas, two-handed Concussive weapons with a Strength bonus. Smash up Monstrous Creatures and multi-wound models, and bring them down to your level! Because sometimes Eavy Armour just isn't 'ard enough, these Orks gear up in Snazzy Armour for a Marine-equivalent Armour Save! Switching out Sluggas for Snazzguns, the Gitz can potentially do horrible things to armoured models. All of them can get a single Kustom Job (same one for all Gitz), and some of them can upgrade to a Snazzblasta or Snazzkannon. Badrukk can join these guys. With 7th Ed Glory Hogz and Tank Hunters, these Boyz are as krumpy as ever! Any one of them can switch out their Rokkit Launcha for an upgraded version, or the revised Tankhamma. Burna Boyz get more burny! Any one of them can swap out their Burna with a Skorcha, a Burnabomb Chukka for some Torrent goodness, or a Burny Fing for some Rending CCW. Da Kream Uv Da Krop! The Ork Nobz entry is one of the biggest in COR, as they follow the same pattern as the Speshul Boyz previously covered - no less than 12 different types of Nobz, not counting raw! Before covering them, we'll look at their shared attributes. The standard Nob profile is bolstered by Eavy Armour. Each one can swap their Slugga for something more shooty, swap their CCW for something more choppy, swap their Armour for something more Snazzy, and take a few other items of wargear. One Nob in the unit can upgrade to a Pain Nob for some welcome FNP, while one other can upgrade to the skilled Meena Nob. If the unit is Infantry, it can take a dedicated transport (the usual 3). Nobz make better use of Mob Rule than ever, due to the fact that it's wound-based - morale is no longer the bane of our Orky deffstarz! Remember the Cybork Slashas from Forge World's Dread Mob list? Reworked and renamed, these guys gain a random effect at the start of the game, usually a stat boost. Nobz with Rokkit Launchas, Tank Hunters and Glory Hogz! Go nuts with Tankhammas and Kustom Rokkits! Our new Boyz got new Nobz! Dakkagun madness with Needz Moar Dakka!, or even crazier with Eavy Shootas or Dakkakannons! Back to the Flash Gitz of 4th Ed, but with the Ignores Cover effect of Gitfindas and a free Kustom Job: Barrelz! for Twin-Linking. Additional Kustom Jobs are on an individual basis with Flash Nobz, and the option of Snazzblastas or Snazzkannons grant even greater firepower. Badrukk can join these guys. Combine the sneakiness of Kommandos with the stats and weapons of Nobz - a deathstar unit suddenly appearing on the flank can be pretty scary! Snikrot can join these guys. Simply Nobz with Strength 5 and no FC. Spam Power Klaws for a phenominal can-opener! And then suddenly Jump Infantry Nobz! Rokkit Pakks provide excellent speed without increasing the model's footprint, allowing your deathstar unprecedented mobility at the same durability. Zagstruk can join these guys. Burny goodness or massed AP3 attacks, with access to more burny things. Deffguns in Elites! Switch out for Beemy Deffguns if you need better anti-tank. You know these guys too, but now they can get Invuls through the Pain Nob. Finally, Orky Terminatorz! And finally there's these bad boyz. All those differences between Boyz and Kopta Boyz? Now the Nobz get them, resulting in 3 T5 Wounds of Pure Ork Jetbike. Part 2 of Elites continues thus. Our first Imperial Armour import, and it's a good 'un. The Mekboy Junka can be a transport, mount an exotic shoota, be kitted out with all sorts of tricky gubbinz, or any combination of the three! The Turbo-Chargaz! rule allows the Junkas added mobility (most of the time...), and they get a squadron bonus rule that assists their random weapons. The Bigga Dread entry wraps up the Mega Dread and Meka Dread into one unit, along with a deadly new variant. Like the Deff Dread before, a Bigga Dread starts out with no weapons and needs to buy two (and may take two more) - dakka or choppa, this git'z got it kovered. He benefits from a 5+ Invul, and a slew of upgrades can make him even trickier. The Mega Dread is the basic Bigga Dread as described above, with the added perk of a fifth weapon. The Meka Dread gains Fixin' Klawz, allowing it to repair nearby vehicles. But then there's the Wurr Dread. The most expensive of the lot, and for good reason. Those of you familiar with Ork words know that Wurr means Weird - we've got a Psychic Pilot 'ere, boyz! Go back to the Weirdboy entry to read up on psychic goodness. More Gretchin! These Speshulists act as cheap supporting units. The Speshul Teem must upgrade to one of two different types: the Eavy Teem and the Sneeka Teem. Any member of either choice can swap their Blasta for a Rifle, get a CCW, or grab Kamo Bitz to improve cover. The Eavy Teem is, if it wasn't clear, a heavy weapons team similar to the AM teams. Any member can upgrade to an Eavy Gunnaz, giving more dakka, Rokkits or Lobbing. The Sneeka Teem can Infiltrate (and get to reduce the distance from enemy units), with access to budget sniper rifles. Regardless of Teem choice, a few models in the unit can be upgraded to grant special rules and wargear to the unit, including the Runtbot for Invuls if there's not enough cover around. Ogryn share the same stats and rules as their AM counterparts, with the exception of cost, Eavy Armour and the Our Weapons Are Useful rule (any Assault weapon counts as a Pistol in combat). They've got a Shoota and CCW, and can replace either of these with something more killy. And yep, there's an Ogryn Nob option - no stronger or tougher than his boyz, but quicker, braver and attackier. So what's the draw to Ogryn? Their surprising versatility! They've got the combat skills of a Nob, the toughness of a Warboss and the aim of a Gretchin - combined with their wargear options, you have a tough unit capable of fulfilling almost any battlefield role! That concludes the Elites. Next time we'll dive into the plentiful Fast Attack choices. You could peep some of the Ork rewrites that have been done already, one idea that stuck with me was to make Waaugh give +2 initiative instead of doubling it, (rather silly to have Initiative 8 Warbosses) and +2 attacks for charging instead of +1. Beyond that, it's a matter of matching point costs with these 11 point Space Marines (at least they can't opt out of paying for Frag/Krak grenades, there'd be hoards of Marines flooding the boards). Version 3.0.5 has launched, providing cost changes, a Big Boss overhaul, and major changes to the Ork Flya to be compatible with the recent Death From The Skies supplement! Like the Speshul Boyz entry back in the Elites, Kwikka Boyz compile several similar units into a single entry. A unit of Kwikka Boyz numbers 5-20. They've got the usual Ork special rules, the usual Boy wargear (but more access to special weapons) and the usual Nob upgrades. Each type of Kwikka Boy adds and/or replaces wargear or special rules. Boyz with Rokkit Pakks make for some very fast Jump Infantry, as adding D6" to either Movement or Assault goes a long way! And due to the usual Boy upgrades, they don't have to be Slugga/CCW Boyz - Jump into position and dakka (and THEN chop)! Bikes make for tougher and faster Boyz, with access to even heavier weapons. A wild Cavalry unit appeared! It used 4+ Armour and +1 Attack! It's super effective! Boyz on Deffkoptas. More Toughness and Wounds, and access to the same heavy weapons as the Biker Boyz. Warkoptas are quite versatile vehicles. In classic Skimmer fashion, they are fragile and fast. In classic COR fashion, they're swimming in options! They naturally have a respectable transport capacity of 12 (but no Bulky freeloaders!) - they can continue down this route with options to improve capacity and support, or follow the Land Speeder-esque approach of quick, manouverable firepower. Warkoptas can be taken in squadrons of 1-5, and units of 3+ get improved Jink saves. Don't forget that, like most Ork vehciles, they're Ramshackle! This entry has gone through a number of alterations, most recently to fit with the Death From The Skies supplement (and Forge World's recent IA update for their flyers). No less than six different flyers comprise the Ork Flya entry: the expected three (Dakkajet, Burna-Bomma, Blitza-Bomma), a brand new Mekjet (which actually preceded the official Wazbom, explaining its absence), the classic Fighta-Bomma and the Supa-Eavy Blasta-Bomma. Each Flya has unique upgrades for its arsenal of weapons (the Blasta-Bomma in particular has a large number of additional weapon choices), and all Flyas have access to a number of miscellaneous upgrades. As with DFTS, the Flyas can be taken in a Flyer Wing, and have access to a unique Wing Leader Trait table (detailed in an earlier post). Ork Flyas are fast, being Supersonic Flyers with decent Pursuit (and possibly Red Paint). How should they use this speed? Tank Shock/Ram other FMCs/Flyers! Also, Squigsharks. Because Dropping Sharks On People. Tune in next time for Part 2 of Fast Attack! Why can't I hold all these Fast Attack? A classic Ork unit, the Warbuggy applies decent firepower on minimum armour, at maximum speed. With an enlarged selection of weapons, access to some neat upgrades (including the 'Ard Case! ), and Outflank, Warbuggies might just find their way into your list. Remember Ramshackle - even in death, a buggy might do some damage! Up to ten of these fragile speedsters can be in a unit - at 4+, they get Acute Senses! Why footslog when you can freeload? The Trukk is the traditional dedicated transport for Ork units - it's as fast as ever, and Ramshackle makes it great again. It can now get a Skorcha as its weapon, and has a load of other upgrade options - this is a good time to mention the Bigga Hold, which gives a vehicle an expanded transport capacity. It was a great Ork who looked at the Trukk and said, "It needz ta be more killy." Gun Trukks combine the fast and fragile nature of the Trukk (sacrificing the transport capacity) with the firepower of Ork artillery, and is essentially a bigger Warbuggy. They start with a Kannon, and can replace it with something bigger depending on what role you need them to fill. Up to five Gun Trukks can be in a unit, and 3+ means more accurate shots against larger targets (MCs, Vehicles, etc.). The next logical step up from a squadron of gun vehicles is a squadron of tanks, but these guys still take up a Fast Attack slot?! A cross between Predator and a Battlewagon, Gun Wagons have the transport capacity of a Trukk, and a single gun which can be anywhere between Okay and 'Uge. A massive list of other options means the Gun Wagon can be 'arder, faster, or just more killy. Gun Wagons come in squadrons of up to three - a full compliment lets them count as Heavy vehicles when shooting. Once just part of a popular rumour-list for the 7th Ed, the Wurlybird has been given life in COR! A Grot transport with minimal armour and just two Hull Points, but it Skims and essentially doubles its transport capacity for its intended passengers thanks to them being Weedy. Zoggin' 'eck, dere's more?! Next post will see the final part of the Fast Attack section.